Battles and Dynasties explored the conflict for the crown from Domesday to the present day through a fascinating display of documents, paintings and artefacts, each fundamental to local and national heritage. The exhibition offered a memorable opportunity to see significant exhibits in two venues in Lincoln, at The Collection and at Lincoln Castle. The Historic Lincoln Trust was delighted that the Domesday Book – the earliest land survey – was a feature of the exhibition. The iconic document was commissioned in 1086 by William the Conqueror following his successful invasion 20 years earlier. Domesday gave the king a picture of his realm by recording the taxable value and resources of all the boroughs and manors in England. The document was generously loaned to the exhibition from its permanent home at The National Archives. The exhibition offered a spotlight on the Battle of Lincoln fought eight hundred years ago on 20 May 1217. Professor David Carpenter described the battle as “Second only to Hastings as the most decisive in English history.” Medieval writers were in no doubt about the significance of the battle and its story was told in a number of chronicles, both contemporary and later, five of which were brought together in the exhibition for the very first time. The Barnwell Chronicle provided a vivid account of the Battle of Lincoln, including a pen-portrait of the redoubtable Nichola de la Haye, castellan of Lincoln Castle, and the Histoire de Guillaume le Maréchal was generously loaned by the Pierrepont Morgan Library in New York. Matthew Paris’ Chronica Maiora has the author’s engaging sketch in the margin conveying a vivid bird’s-eye view of the battle scene with the royal standard flying over Lincoln Castle, while one of Peter des Roches’ crossbowmen takes aim at a couple of fleeing French knights. The group of documents also included the earliest surviving manuscript of the account of Ralph of Coggeshall, written during the years immediately after the fight with his text enlivened by the inclusion of striking eyewitness accounts, and a later manuscript, the Annals of Nicholas Trevet from the fourteenth century. Monarchs were represented in the exhibition through a number of striking portraits. In 1635 King Charles I, aware of the importance of portraiture in creating an image of royalty, commissioned Sir Anthony Van Dyck to paint his masterpiece, Portrait of King Charles I in Three Positions. 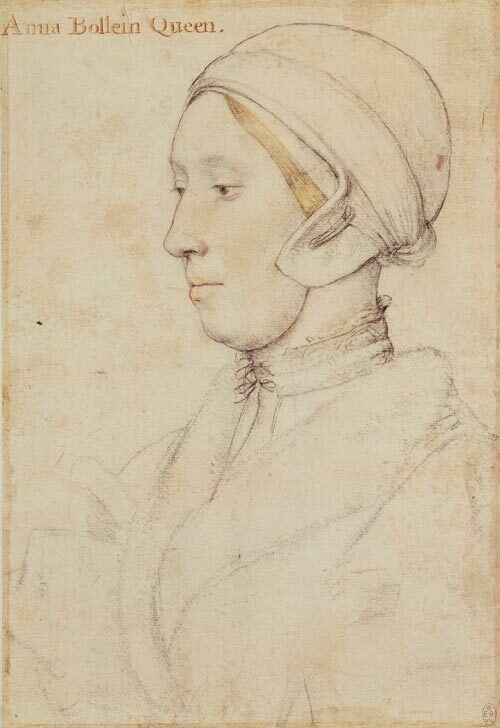 Also on display was a delicate portrait of Anne Boleyn, drawn with chalks on paper, by Hans Holbein the Younger. In the portrait the queen is portrayed wearing a night gown and chemise, with an undercap on her head. The Queen’s Privy Chamber was, despite its name, a public rather than a private place, and the king himself was recorded as receiving visitors in a night gown. Both these exhibits were generously loaned by Her Majesty The Queen from the Royal Collection Trust. Battles and Dynasties was brought together by Lincolnshire County Council and Lord Cormack in partnership with the Historic Lincoln Trust, The National Archives and the British Library. The exhibition was made possible as a result of the Government Indemnity Scheme. Grateful thanks were extended to all the lenders, sponsors and donors who made this exhibition possible.